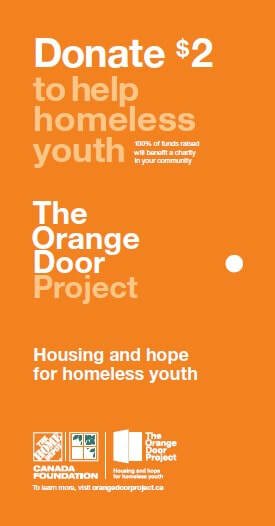 The Orange Door Project campaign is The Home Depot Canada’s in-store fundraiser to help prevent and end youth homelessness. Until Dec. 17, anyone who visits the Burlington or Milton Home Depot stores will have the opportunity to donate $2 at the checkout in support of the Bridging the Gap program. When you donate to the Orange Door campaign at the Home Depot store, every dollar supports the work we do here in Halton. The Home Depot covers all the administrative costs which means we will benefit from 100% of your donations. We are sincerely grateful for the support of the Home Depot Foundation and customers who give so generously.